This collection of questions will be regularly updated. Q: What is the deadline for the proceedings? A: The deadline for proceedings contributions is Friday, 1st November 2013. Q: In which format should I prepare my proceedings contribution? A: All proceedings contributions must be prepared in the PoS style. Please use the skeleton LaTeX file contained in your invitation email, and upload your PDF files to the PoS website following the instructions in that email. Q: What is the page limit for proceedings contributions? A:The page limits are 7 pages for parallel talks and posters, 15 pages for 30-minute plenary talks, and 20 pages for 45-minute plenary talks. Q: May multiple proceedings contributions be combined into one? with subject "LATTICE 2013 proceedings, YOUR NAMES AND PoS CONTRIBUTION NUMBERS" and let us know under which PoS number you wish the combined proceedings to appear. Q: Should I upload my proceedings contribution to the arXiv? A: You are strongly encouraged to upload your proceedings contribution also to the arXiv using the usual arXiv upload procedure. Please put "presented at the 31st International Symposium on Lattice Field Theory (Lattice 2013), 29 July - 3 August 2013, Mainz, Germany" into the comment field to aid the search for proceedings contributions. Q: Can I buy a Lattice 2013 t-shirt at the conference desk? A: We deeply regret that for both legal and practical reasons, we are unable to sell t-shirts at the conference office. Those participants who would like to buy the conference t-shirt to complete their collection of lattice shirts or because they like our design can however download all the files required to have the t-shirt printed at a print shop from this link. Q: When can I check in during the conference? A: A registration desk will be available during the Welcome Reception at Proviant-Magazin Mainz on Sunday, July 28, 6-9 pm. After that you can of course check in at the Conference Office. Q: In which format should I prepare my parallel talk? A: Parallel session talks are 15 minutes (plus 5 minutes for discussion). Please prepare your presentation in Adobe Portable Document (PDF) format; Powerpoint (.ppt, .pptx) or OpenDocument Presentation (.odp) formats are also acceptable, but other formats cannot be supported. Q: In which format should I prepare my poster? A: Posters should be printed in A0 portrait format (841 mm wide, 1189 mm high) or smaller. They must be affixed to the assigned poster boards (using only the removable adhesive strips provided) before 5pm on Tuesday and removed by noon on Wednesday. Note that there are no facilities for printing posters at the conference site! Q: How and when should I upload my presentation? You may upload your parallel session presentation in PDF, Powerpoint (.ppt, .pptx) or OpenDocument Presentation (.odp) format starting now, and you must upload it at least one hour prior to the start of your parallel session. To upload your talk, please log into the conference management system and select "View your papers/sessions", then click on the little Powerpoint-like symbol under "Actions", select the file to upload and click on the button "Upload presentation". Q: How do I reach the city of Mainz from the airport? A: Detailed travel information can be found here. Q: How do I get to the conference venue on Mainz University Campus? A: All buses leaving from the bus stop “G” at the central railway station pass by the university. You can get off at either of the bus stops “Universität” or “Friedrich-von-Pfeiffer-Weg”. 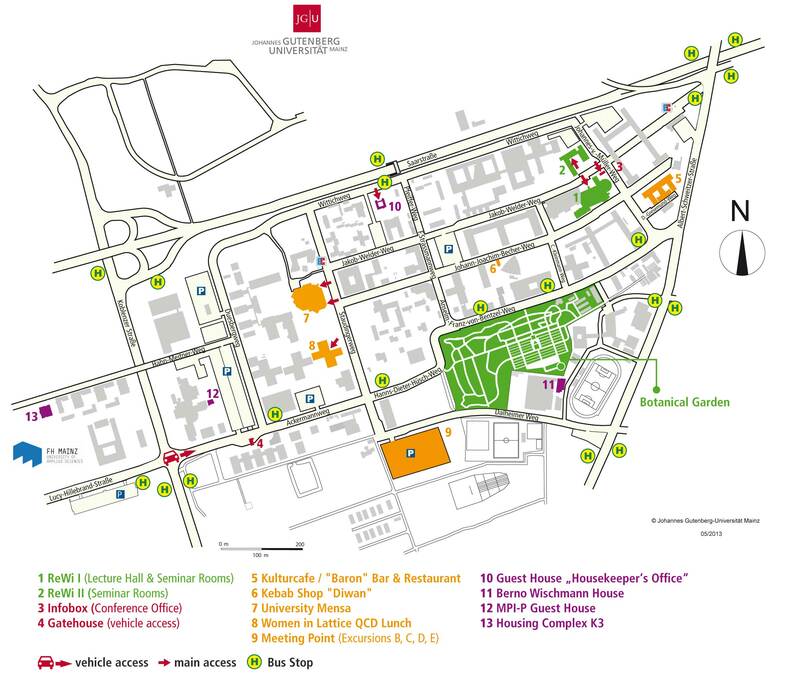 You will find the conference venue and office on the campus map. Q: Where can I park on the Mainz University campus? Is there a charge for parking? A: During the conference you will be permitted to park on special parking areas for guests on the campus (see map). As participant of Lattice 2013 you will receive an entry and parking permittance at the gate house of the vehicle access (see map). There is no charge for parking. A: You can have lunch at the university mensa, where a special counter and separate seating area will be available for conference participants. Payment will be possible using the charged mensa card included in your registration pack. Menus and further details can be found here. Q: Will a meal be served at the Welcome Reception? A: At Proviant-Magazin Mainz a selection of appetizers and beverages will be served. Q: Will there be vegetarian food? A: We have arranged for vegetarian options to be available both at lunchtime and at the conference dinner. If you have more stringent dietary requirements, please contact us early, so that we can try and arrange suitable alternatives. Q: Will there be food suitable for people with allergies? A: At lunch, food containing gluten or dairy products will be marked as such, and there will be alternatives. The caterers at the special events are aware of allergy and food intolerance-related issues and will be happy to advise any participants who have questions which of the items on offer are suitable. Q: Do I have to arrange for accommodation myself? A: Yes, you have to arrange for accommodation by yourself. To help you, we have pre-reserved rooms at special rates at various hotels of various price categories. The list of hotels can be found here. Please remember to quote "LATTICE 2013" when making your booking in order to benefit from the special rates. Q: Are there dorm rooms for participants entitled to a reduced conference fee? A: Yes, but only a very small number of rooms are available in our guest houses on the JGU campus and on the campus of the nearby University of Applied Sciences (FH). Note: Application for such a room is only possible after receipt of the reduced fee, and rooms will be allocated strictly on a first-come, first-served basis. These rooms are now booked out. Q: Are there any other budget options? and we will put you in contact with other participants intending to stay there so that you can agree on how to best share a room together. Q: Are there still places available on the excursions? A: We regret that all excursions are now fully booked. Q: Where does the conference dinner take place? And what's the menu? Q: Am I entitled to a reduced fee? A: If you have a very constrained travel budget (e.g. because you are a student, or as a result of budget cuts), you can apply for the reduced conference fee. Further details can be found here. Note: the financial support budget is now exhausted. Q: What if I need a visa? A: Information on visa-related issues can be found here. Q: Where can I find the abstract submission form? A: On the conference management website, please follow the link "Paper submission" to submit your abstract. Q: May I use TeX in my abstract? A: Of course you are most welcome to use TeX in your abstract. While the conference management software does not render it, it will be rendered (using MathJax and PDFLaTeX) when the abstracts are put online. Q: May I present two talks, or a talk and a poster? A: Since we expect the parallel programme to be extremely full, we cannot allow participants to present two talks. Exceptions might be made only in truly exceptional circumstances (such as when a researcher cannot attend for health or visa reasons and another participant is to give his talk in addition to his own). The poster session is also likely to be rather packed, so we cannot guarantee that participants who already give a talk can be allowed to present a poster as well. You are welcome to submit an abstract for both a talk and a poster, but if space becomes tight, the poster will have to be cut from the programme; in either case, we will of course let you know as soon as possible. Q: Do I really have to give full address details for my coauthors? A: The conference management software used requires an address for each person, including coauthors; this feature is hardwired and cannot be turned off. If you find giving full address details for your coauthors to be too much effort, you can give a string such as "none" for their street address, and "12345" for the postal code; since the system cannot distinguish valid and invalid addresses, this should go through just fine, and we don't mind as long as you give correct names, affiliations and email addresses for your coauthors.